Biofuels - Chemistry of Biofuels - How are Biofuels produced ? How are Biofuels Produced ? How do Biofuels Burn ? Biofuel Chemistry: What are Biofuels and How are They Made? In a previous article we said that a biofuel is any fuel from which energy is obtained through a process of biological carbon fixation. Remember that a biofuel is made from a living organism, or very recently living organism, and has not gone through thousands or millions of years of geological changes. In this article we look at the chemistry of biofuels to get a better idea of just how they differ from other fuels. Petroleum diesel (petrodiesel) is a product produced through the fractional distillation of crude oil. The product contains a mixture of hydrocarbon molecules that range in size from 8 to 21 carbon atoms. A typical petrodiesel molecule would look something like this 16-carbon molecule. Note that the petrodiesel molecule is a pure hydrocarbon, containing only hydrogen and carbon atoms and no oxygen. In ideal conditions, with abundant oxygen, burning this molecule releases only CO2 and H2O. Of course, oxygen makes up only 21% of the gas in air, with the rest being a mixture of about 78% nitrogen (N2) and small amounts of other gases like methane, neon, helium, hydrogen, etc. Beyond that, many petroleum deposits are contaminated by hydrogen sulfide (H2S) and other sulfur compounds. The result is that burning petrodiesel produces sulfur compounds like sulfuric acid, nitrogen compounds like nitric oxide, and other contaminants. In other words, the reaction is not ideal. 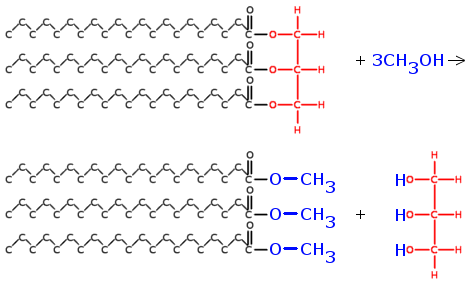 Compare the petrodiesel molecule above with a typical biodiesel molecule as shown here. In many ways, the biodiesel and petrodiesel molecules are similar. In fact, the only real difference is on the right side of the molecule where the biodiesel has two oxygen atoms compared to the petrodiesel molecule. These oxygen atoms are what make all the difference in biofuels like biodiesel, when they are burned. Oxygen is present in biodiesel because of the way it is produced. Petrodiesel is produced under anaerobic conditions over very long periods of time. These conditions result in the removal of oxygen from dead plant and animal matter, leaving only hydrogen and carbon to form petroleum and other fossil fuels. Biofuels, on the other hand, are produced through a process known as transesterification. In this process, fats and oils from living organisms are broken apart to yield very long molecules that contain the oxygen we see above. Here is how the process works. This is the way that most biodiesel is produced and it yields a molecule with slightly different qualities than petrodiesel. 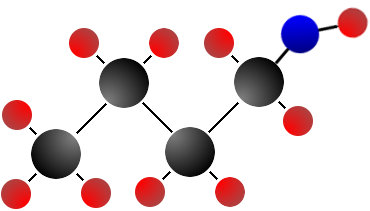 In essence, you take a triglyceride (made of three fatty acids and a glycerol molecule that is shown in red) and you react that with methanol (shown in blue). This yields a mixture of fatty acid esters (black and blue) that can be used as biodiesel as well as a glycerin (blue and red) molecule that can be removed for use in chemical applications, food processing, and other settings. Oxygen makes all the difference in these molecules. The chart below lists some of the physical characteristics of biodiesel and compares them to petrodiesel. What you see is that biodiesel provides better knock protection (cetane number), but a lower energy density than petrodiesel. It produces less sulfur emissions, but more nitric oxide emission. Biodiesel freezes at warmer temperatures and is less stable during long term storage (oxidative stability). It provides better lubrication than standard diesel. Every single one of these differences is the result of the addition of the ester group to the long chain of hydrogen and carbon. Beyond changes in physical properties, biodiesel offers differences in chemical properties as well. First of all, the extra oxygen already contained in the molecule is useful during combustion because it provides for a more efficient burn. The net result is that less CO is produced because there is more oxygen to produce CO2. Interestingly, the total amount of CO2 produced is lower than that produced when petrodiesel is burned. The second chemical difference between petro and biodiesel deals with degradation. Biodiesel is biodegradable. The ester group makes it possible for biodiesel to be taken up by microorganisms and degraded. It also allows biodiesel to degrade through processes such as exposure to light and it means the biodiesel spontaneously degrades at a set rate over time. This is good when the fuel is spilled, but can cause problems during long term storage. The third difference, and one that is a problem with biodiesel, is that the oxygen atoms make the molecule polar. That simply means that the end of the molecule near the oxygen has a net negative change and the end farthest from it has a net positive charge. In petrodiesel, there is no charge and the entire molecule is neutral. The problem with having polarity is that it makes it easier for the molecule to form into a crystal structure. In other words, it makes it easier for the molecule to freeze. Biodiesel freezes at temperature as much as 25 degrees Celsius above that of petrodiesel. Thus, biodiesel is less suitable for use in cold climates. The fourth chemical difference between petro and biodiesel has to do with corrosion. The polarity of biodiesel makes it more prone to react with materials around it. This is particularly true of metals like zinc, copper, tin, and lead. Thus, biodiesel can speed up the process of corrosion (rusting) of these metals and decrease the lifespan of some engine components. In the same way, biodiesel is more reactive with molecules called elastomers, which give rubber its flexibility and durability. When biodiesel damages elastomers, it makes rubber more brittle and causes it to crack. The result is damage to gaskets, fuel lines, and other engine connections that contain rubber. As a result of the last two differences, engines often have to be modified or built differently to handle biodiesel. This means that older diesel engines cannot handle biodiesel at all. Modern engines are often rated using terms like B2, B5, B20, and B100, which refer to the percent of biodiesel that they can handle. 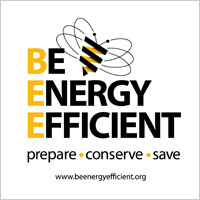 A B5 engine can tolerate fuels that are up to 5% biodiesel without damage to engine components. A B100 engine can run on 100% biodiesel. The biggest difference between these biofuels (ethanol and butanol) and biodiesel, is that organisms can produce ethanol and butanol on their own. This means there is no need to harvest an organism to obtain a raw product that is converted to biofuel. The advantage of such an approach is that fewer nutrients and less water are required. The molecular structure of ethanol, butanol, and gasoline are diagramed below. Note that the only real difference, structurally, between ethanol and butanol is the number of carbon atoms they contain. Note that octane is used to represent gasoline even though gasoline is actually a mixture of hydrocarbon molecules ranging in size from four to twelve carbon atoms long. 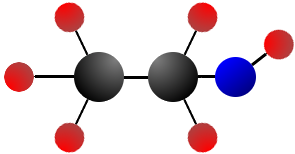 Octane, one of several molecules in gasoline. Ethanol and butanol are both considered biofuels because they can be produced from living or recently living organisms. Like the differences between petrodiesel and biodiesel, the big difference between ethanol/butanol and gasoline is the presence of oxygen. In the case of alcohols (ethanol and butanol are alcohols) there is no ester group, but there is an alcohol group (just an oxygen with a hydrogen attached). This difference means that alcohols behave differently from the esters that make up biodiesel. The chart below compares gasoline to ethanol, butanol, and biodiesel. The thing to note is that ethanol has a very low energy density compared to gasoline, but butanol is pretty comparable. It requires about 1.5 times as much ethanol as it does gasoline to generate the same power. In a car, that means you need 1.5 gallons of ethanol to travel the same distance as you would on one gallon of gasoline. Clearly butanol is more similar to gasoline than is ethanol. The problem is that producing butanol is more difficult and has not been reliably demonstrated on a large scale. Many organisms, like yeast and even some types algae, produce ethanol as part of their normal chemistry. That is to say, a number of organisms produce ethanol just like plants produce oxygen or humans produce carbon dioxide. Many organisms only need carbon dioxide and an energy source to produce ethanol. In the case of algae, only water, sunlight, and CO2 are needed. Thus, it is easy to produce ethanol. The problem with ethanol, beyond energy density, is that it is highly corrosive to engine component, particularly rubbers, and it takes a great deal of energy to produce. Changing feedstock from corn to something like Jatropha or simply using algae can help to offset this energy input, but so far it seems that more energy is needed to produce ethanol than is derived from it. Besides, algae are better at producing biodiesel. Butanol is less corrosive than ethanol and because it takes about the same amount of energy to produce, it is more efficient in the long run. The problem with butanol production is that it is difficult to do on large scale. Recently, several companies have devised plans to produce butanol in large quantities and are moving forward with plans to make it a commercially viable fuel. Like biodiesel, both ethanol and butanol are biodegradable. Unlike biodiesel, they do not freeze at lower temperatures and are more stable during long term storage. Thus, these biofuels may offer better alternatives to gasoline, in the long run, than biodiesel offers compared to petrodiesel. An understanding biology is assisting in the production of biofuels. By genetically modifying organisms, some companies have been able to induce things like algae to produce fuel that is so close to gasoline that one can hardly tell the difference. If it is possible to complete this process without investing a great deal of energy from standard fuels and thus obtain most energy from sunlight, then the production of fuel in this manner can actually reduce carbon emissions. This occurs because more carbon is taken up to produce the fuel than is released when it is burned. This holy grail of biofuel production has yet to be obtained, but it is theoretically possible.